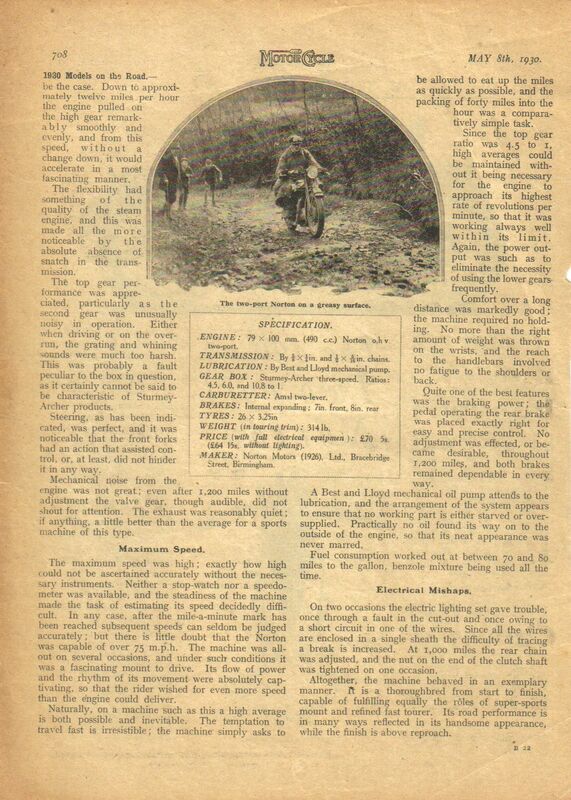 -SG- Following on from recent postings about Kaye Don and his 1930 visit to the IOM with a Model 20, here's a copy of the road test from May 8th., 1930. 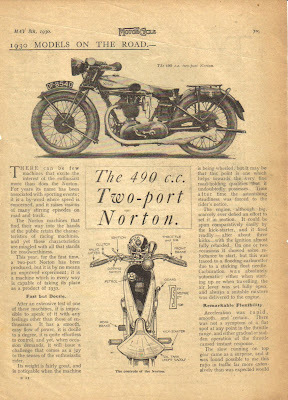 As usual with road tests at the time, it actually tells one very little but there is quite a good drive side shot of the bike showing the 1930 style silencer (pretty close to the parts list illustration), the pressed steel primary chain case and the battery mounted on the seat tube (oil tank half usual size as a result). Paint scheme on the tank matches up with other original 1930 photos on the blog. (This one, this one plus Mr Don). The 1930 Norton brochure - which I have just referred to on another query - states that chromed petrol and oil tanks were standard on the twin port models (20 and 22) and available on other models at extra cost. 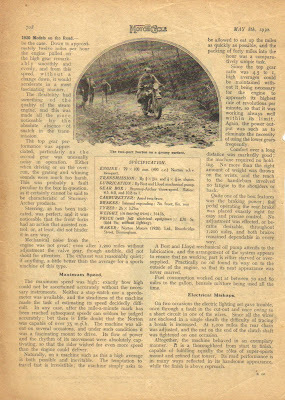 Incidentally, although 1930 Model 20 frames look much like the other diamond frames used on the 1930 range, there are a couple of subtle differences: the rear wheel lugs incorporate pusher bolts for chain tension adjustment rather than the push bike type used on the rest of the standard range, and the front down tube and seat tube are slightly shorter than those of the 1930 Model 18s and slightly longer than those of the 1930 16Hs. For what reason this was I have no idea unless it was a purely commercial one of using up old stock where it would not be noticed!